Beautiful apartment, clean, ideal location. Perfect! If you have a vision of the perfect place in France for a vacation, this is it! A clean, large apartment with modern kitchen/dining/living room/bath and balcony overlooking the Mediterranean - what more can you ask for? Well, a short walk on the private path takes you to the Sea where you can take a swim or just lay about. Many coastal cities and villages are within a 2 hour drive such as Marseilles, Cannes, Monaco, Monte Carlo, St. Tropez, Antibes, Nice, etc. L'Occitaine and Fragonard are perfume factories within 2 hours' drive also. My favorite city/town was Aix de Provence and St. Paul de Vence. Famous art museums abound - Picasso, Matisse, Chagall - and more, were inspired by the beauty of Provence as will you. "My Vigie" is charming as is the owner, Isabelle, who is very knowledgeable and will gladly give you driving tips and restaurant recommendations that were invaluable. I highly recommend staying here for every reason. I will definitely return. We arrived at our apartment with high expectations, and our hopes were exceeded. This place is beautiful inside and out. The property and garden are immaculate, and the VIEW! Wow...panoramic scenery of the ocean. We were able to visit other apartments, and each window seemed to host the same breathtaking vista. Stepping into our 2 level flat was like entering a modern villa. High ceilings, brand new kitchen with shiny modern appliances, large dining table and comfy living room furniture. And there was that amazing view again with large sliding glass doors opening onto a delightful patio. Tables and chairs arranged perfectly for watching the sunset over a glass of wine. I rented this with my mom and sister, and upstairs we had two bedrooms. One room with perfect twin beds and the other with a roomy full bed. The bedding was luxurious, with plush down comforters, pristine linen and plenty of plump fresh pillows. Our bathroom was perfect with lovely sink, new fixtures, abundance of lush towels, and a shower with LOTS of hot water (a blessing with three girls primping). The entire apartment was spotless - and we appreciated the large clean windows for those breathtaking views. We were able to meet our gracious host, Isabelle, and she was warm and helpful in finding great places to eat a short walk down the hill. She even showed us her path to a secluded swimming area so that we could avoid the main tourist beach. I could go on and on about how fabulous our vacation was, but if you are considering this property for a vacation, I highly encourage you to book soon. We reserved the last room for the month and would have regretted missing the chance to stay here. It's seldom that a place has all positives, but My Vigie is a hidden gem. L'appartement est très bien situé, avec une large vue sur la mer, au calme. Il est très agréable à vivre. La petite terrasse permet de prendre tous les repas dans un cadre exceptionnel. Crique très proche. La propriétaire Madame Cacheux facilite la vie de ses vacanciers. Que du bonheur.Nous avons passé une semaine de rêve dans cette magnifique demeure ,située dans un cadre exceptionnel,un parc verdoyant et calme avec vue sur mer,à proximité des commerces et à 5 minutes du centre ville.L'appartement est vaste,propre et très bien équipé.Isabelle la propriétaire ,très sympathique a su nous conseiller sur les différents sites à visiter et les choses à voir dans cette magnifique région.A refaire dés que possible. 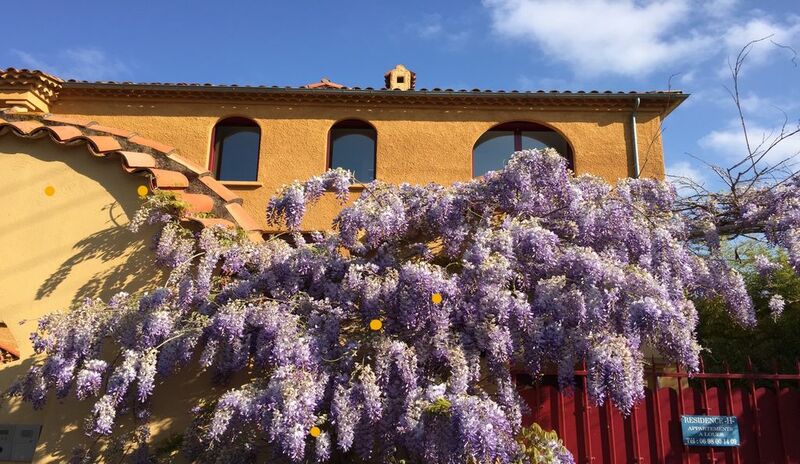 (Text automatically translated) take the highway., Fréjus Saint Raphael, continue on the seafront in the direction of Cannes, turn right just after the new marina to enter the private park of Santa Lucia.